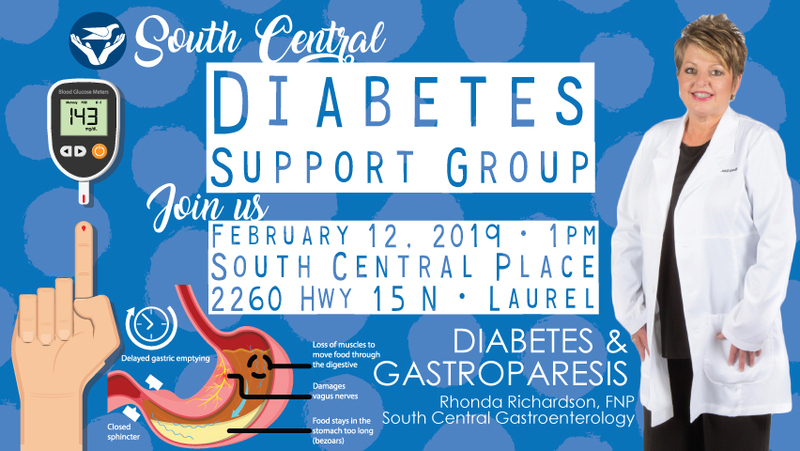 South Central Regional Medical Center invites you to attend the South Central Diabetes Support Group on Tuesday, February 12th at 1 p.m. Rhonda Richardson, FNP, at South Central Gastroenterology will discuss living with diabetes and gastroparesis. Gastroparesis is a disorder affecting people with both type 1 and type 2 diabetes in which the stomach takes too long to empty its contents. South Central Diabetes Support Group is a monthly meeting offered to educate and support individuals with diabetes and caregivers of people who are diabetic. The meetings are held on the second Tuesday of each month at 1 p.m. at South Central Place in Laurel. For more information about South Central’s Diabetes Education Services, please call 601-426-4934 or visit scrmc.com.